From the New York Times-bestselling author of Quitter and Start comes the definitive guide to getting your dream job. When you don't like your job, Sunday isn't really a weekend day. It's just pre-Monday. But what if you could call a Do Over and actually look forward to Monday? • You’ll hit a Career Ceiling and get stuck, requiring sharp skills to free yourself. • You’ll experience a Career Bump and unexpectedly lose your job, requiring strong relationships to survive. • You’ll make a Career Jump to a new role, requiring solid character to push through uncertainty and chaos. • You’ll get a surprise Career Opportunity, requiring dedicated hustle to take advantage of it. Jon Acuff’s unique approach will give you the resources to reinvent your work, get unstuck, and get the job you’ve always wanted! 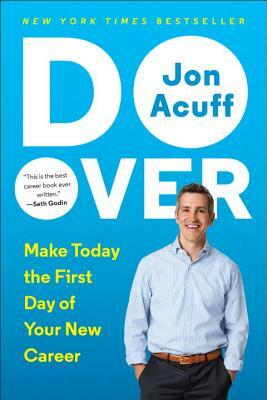 JON ACUFF is the author of five books, including Quitter and the New York Times bestseller Start. For nineteen years he's helped companies like the Home Depot, Bose, Staples, and AutoTrader.com tell their stories. He's a well-known public speaker, and his blogs have been read by millions of fans. He lives in Nashville with his wife, Jenny, and their two young daughters. “As Abraham Lincoln once said, being forced into work you don’t love is like paying to upgrade your cell phone to the latest model: no one should have to do that! Fortunately, you don’t need to do at least one of these things anymore. Take it from me and from Honest Abe: Jon’s book can get you unstuck."